Long-awaited second album from Seattle pop darlings Math and Physics Club! The band first captured our hearts in 2005 with the charming ‘Weekends Away’ EP, which quickly sold out of its initial pressing. The band’s brand of literate acoustic-based guitar pop has garnered frequent comparisons to The Smiths, Belle and Sebastian, and labelmates The Lucksmiths, and their self-titled debut full length was named best indiepop album of 2006 by PopMatters. Picking up where their excellent 2007 ‘Baby I’m Yours’ EP left off, Math and Physics Club return with their first long player in nearly four years. ‘I Shouldn’t Look As Good As I Do’ is a smashing collection of ten new pop gems, chock full of the chiming guitars and sweet melodies we’ve come to expect, but it also packs a punch their earlier work shied away from. Seattle producer Martin Feveyear (Presidents of the USA, Mark Lanegan) helped the band dial in rich, clean tones reminiscent of their 80’s influences like The Housemartins, but with a decidedly modern luster. The ten tracks clock in at less than 25 minutes, showcasing the band’s knack for crisp arrangements and good sense to know when a song just doesn’t need that extra chorus. Lyrically the album continues the themes of love and heartbreak that are signatures of the band’s earlier recordings, but songs like ‘Everybody Loves a Showtune,’ ‘The Internationale’ and ‘We’re So DIY!’ also catch them poking fun at theater culture, faux celebrities, and even at themselves. First single ‘Jimmy Had a Polaroid’ starts out in familiar MAPC fashion, but as soon as the drums and bass rumble into the picture you realize this is no twee affair. As chiming guitars whirl through the choruses, the rhythm section keeps things driving at a fast clip that will surely get the kids dancing. Among the other highlights, ‘Everybody Loves a Showtune’ is an unexpected slice of folk pop full of banjo, accordion, trombone, tuba, and timpani. The story follows a clueless chorus boy who brings a musical production to its knees when he breaks ranks. ‘Love or Loneliness’ is one of the album’s most surprising tracks as the band stretches into new musical territory with a straight ahead rock beat and sweeping mellotron reminiscent of ‘Out of Time’ era REM. Meanwhile, ‘Will You Still Love Me’ is a fast-paced homage to bands like The Housemartins and Heavenly, with Charles’ vocals melding with guest vocalist Jen Garrett of Seattle band Stuporhero to deliver a sweet tale about insecure lovers. ‘We’re So DIY!’ closes the album with a tongue-in-cheek tribute that condenses the indiepop handbook into a tidy two minutes, complete with handclaps and Beach Boys-drenched harmonies. Oh yeah! 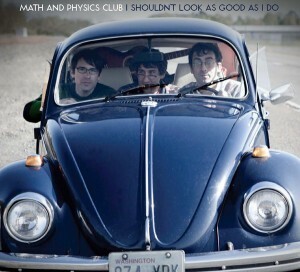 ‘I Shouldn’t Look As Good As I Do’ is Math and Physics Club’s most confident and sharply written work to date. What sophomore jinx? We’re happy to have them back!